The firestorm destroyed 790 homes the first hour. Swirling winds inside the flames whipped up an inferno that reached 2,000 degrees, hot enough to boil asphalt and vaporize nearly everything in its path. The fire jumped two freeways and was headed to Montclair and Rockridge before the wind shifted late in the afternoon. People who lived in the neighborhoods above Hiller Highlands had little or no warning and were forced to flee through swirling embers and thick, choking smoke. Most of the 25 victims, including an Oakland Fire Department battalion chief and an Oakland police officer, perished on those steep, narrow, twisting roads. Roughly 72 hours later, the fire was contained. Besides the 25 people who perished, 150 were injured, and an incredible 3,800 residences destroyed. 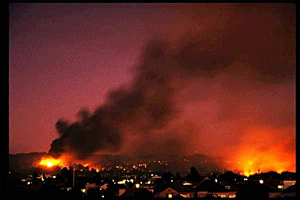 Click here to listen to the special KQED News broadcast on the fire from Oct 21, 1991. You'll hear interviews with residents, audio from a police barricade at which distraught homeowners were being organized to tour the affected area, and chilling descriptions of the other-wordly landscape and sky created by the blaze.